Xpressions Snap!™ pop up displays… the ultimate in frame-graphic technology, wildly popular with today's trade show and special event industry designers. 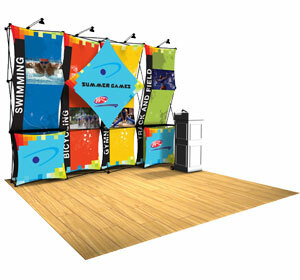 Create a stunning 3-dimensional display for your brand using one of twelve frames and hundreds of available integrated fabric configurations. The frame is shipped with the fabric skins fully attached. The portable, lightweight frame makes your display setup a snap! No tools or event labor required. Choose from one of the popular kits below or contact us to create your own. Select Kits are our most popular Xpressions Snap!™ pop up display configurations — with each kit including lighting and a shipping case. Each kit features the use of premium, recycled graphic material for a truly eco-friendly display. 32¼″w × 94″h, 3 graphics, 1 light & hard case. Weight: 21lbs. 63″w × 63¼″h, 5 graphics, 2 lights & hard case. Weight: 26lbs. 63″w × 94″h, 3 graphics, 2 lights & hard case. Weight: 29lbs. 117½″w × 89½″h, 7 graphics, 4 lights & hard case. Weight: 42lbs.